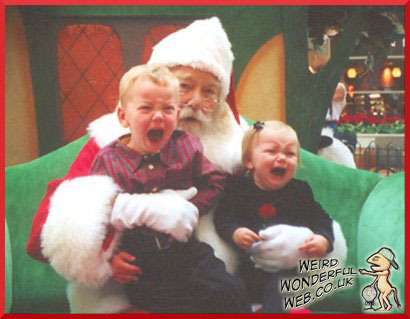 Weird Wonderful Web: Santa scares the shmiles out of me! If you're a parent of young kids, you've probably stood in line at some shopping mall grotto, just to give your little ones the thrill of meeting THE Santa. After the uncomfortable long wait with all your Christmas shopping, irritable, bored kids and several potential punch-ups with pushing-in parents. It all becomes worth it in the end when your little treasures meet the man himself and their little faces light up. Not only that, you get to treasure the moment forever with the obligatory overpriced photo you are forced to buy.